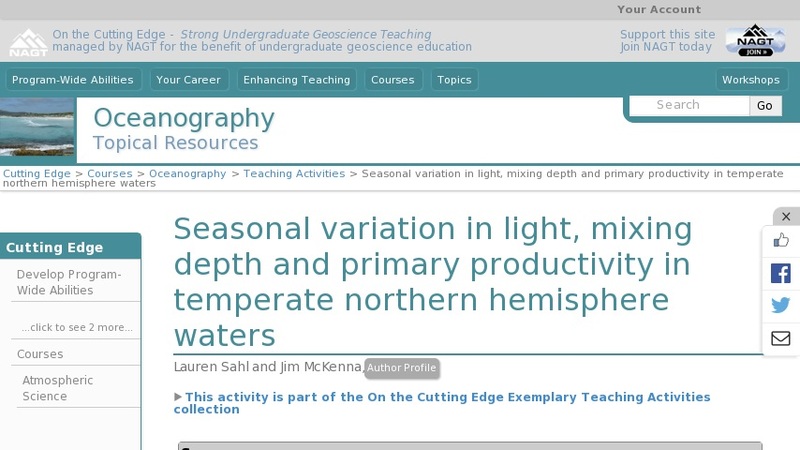 In this exercise students work with light, temperature, and phytoplankton biomass proxy (chlorophyll a concentration) data to; Become more skilled in reading and interpreting semi log graphs, temperature profiles, and time series plots. Practice unit conversions. Gain an understanding of k, the attenuation coefficient for nondirectional light. See how the depth of the photic zone and the surface mixed layer varies seasonally at temperate latitudes and how this relates to seasonal phytoplankton productivity dynamics.